An impact crater near Tempe Terra. Despite this crater likely being extremely old and filled-in with material, we can still see its ejecta blanket. 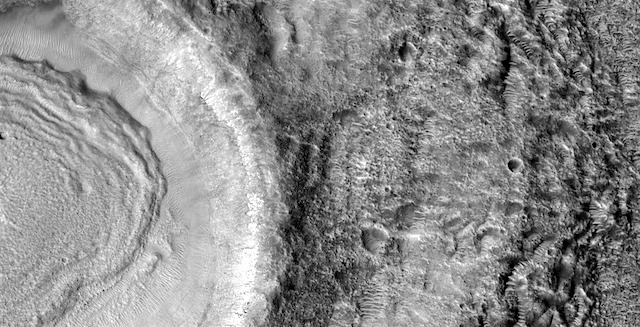 This entry was posted in Reports and tagged Beautiful Mars, crater ejecta, High Resolution Imaging Science Experiment, HiRISE, impact craters, Mars Reconnaissance Orbiter, MRO, NASA, Tempe Terra, University of Arizona. Bookmark the permalink.